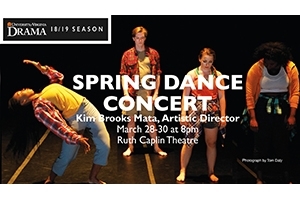 Each semester, the Dance Program presents a concert showcasing works by students, faculty and guest artists. The topics explored in the works vary from semester to semester and reflect each individual choreographer’s creative interests, invariably resulting in eclectic, provocative and engaging performances. In both class and productions, the Dance Program is designed to give students a broad experience in the field of dance while focusing on the development of strong technical, creative, and articulate artists.